Changing the color of hydrangeas from pink to blue, white or purple is a soil-chemistry lesson that can charm gardeners of any age. Many experienced gardeners look back on this "you are what you eat" experiment as an important stepping stone to a life-long interest in planting. Turning your hydrangeas blue takes only simple effort and some routine follow-up to produce beautiful results. Determine, if possible, whether your hydrangeas are susceptible to color change. Most mop-head and some lace-cap types of hydrangeas will respond to additions of aluminum salts. PeeGee and oakleaf types are seldom responsive. Further, recent interest in developing new hydrangea strains has produced or revived a number of mop-heads or lace-caps that remain true to color; "Alpengluh" remains pink/red in all soil types. "Forever Pink" is exactly that. Among the whites, "Annabelle" has been treasured for years for its consistent true white color. For many garden projects, a soil test is the first step. Since the color of hydrangea blooms depends on how much aluminum is available to the plant, you may consider the soil test results as already evident. Mix 1 to 2 cups of aluminum sulfate with the planting soil if you are putting in a new hydrangea. After that, add 1 to 2 cups as side-dressing (scratched and watered into the soil around the plant to a depth of 1 to 2 inches) at least twice a year. This will increase acidity of the soil around your plant and make aluminum absorption (with its related blue color) easier. Trial and error will teach you the exact amount of aluminum sulfate and the frequency of application needed to maintain blue blossoms. Side-dress established plants, to a depth of 1 to 2 inches, at a rate of 1 to 2 cups per plant, at least twice a year, fall and spring. Remember that soil chemicals can take months to be absorbed by plants. Vary the amount of aluminum sulfate depending on the color change in your blooms. Pale pink to pale blue suggests right-on-track. Pink to purple suggests a heavier hand. This is, after all, an experiment. Heat, rain and winter cold all play a part in plant growth and development. As many advertisements state: results will vary. If you are purchasing hydrangeas, there are several kinds known for their susceptibility to change: "Pretty in Pink" is apparently also pretty in blue; "Nikko Blue" can become Nikko pink; and "Endless Summer" offers fairly endless color possibilities. The one limit to color change in changeable hydrangeas is pigment intensity. 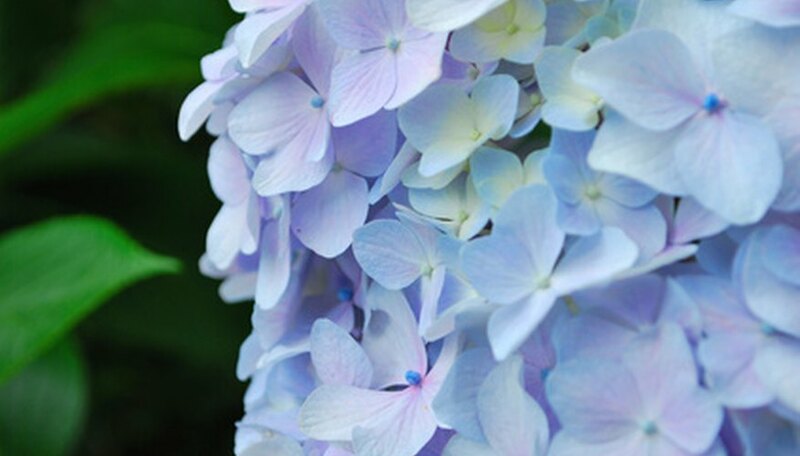 Just as people suntan to varied shades, depending on skin-chemical content, a hydrangea capable of being a soft blue will become a soft pink; a dark blue can change to a near-red. Prepare to persist in your efforts. Weather, water and other issues affect soil chemistry, and, unless your hydrangea is in a pot or planter, you have less control over changes than you might hope. Keep on keeping on to produce consistent color results. Regular effort plays an important part in eventual success. Remember that aluminum sulfate is no substitute for fertilizer. Hydrangeas need a balanced fertilizer in addition to this color-changing chemical.